Description: Weave a stunning necklace by creating dimensional sculptural peyote spiral circles. 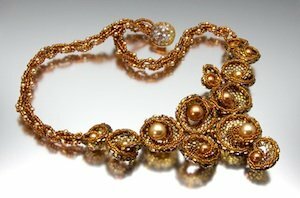 Embellish the piece with accents of Swarovski pearls for a spectacular result. Finish your elegant woven piece by preparing a beautiful spiral rope chain to accompany it. 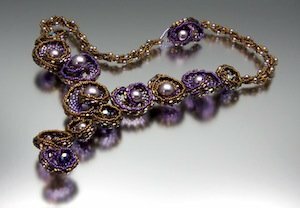 The instructor will also show students how the various components within this necklace can be used to make other complimentary jewelry pieces.